By paying attention to the sounds and behaviors of birds, students are introduced to a whole new way to experience and observe what’s happening in their surroundings, both during their field experience and back home. 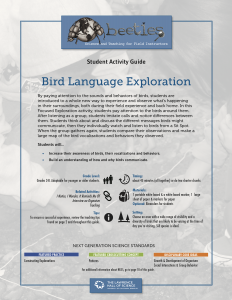 In this Focused Exploration activity, students pay attention to the birds around them. After listening as a group, students imitate calls and notice differences between them. Students think about and discuss the different messages birds might communicate, then they individually watch and listen to birds from a Sit Spot. When the group gathers again, students compare their observations and make a large map of the bird vocalizations and behaviors they observed. Increase their awareness of birds, their vocalizations, and behaviors. Build an understanding of how and why birds communicate. Looking for more bird-related resources? Check out Ian Gledhill’s Tale from the Field about birding on the trail.